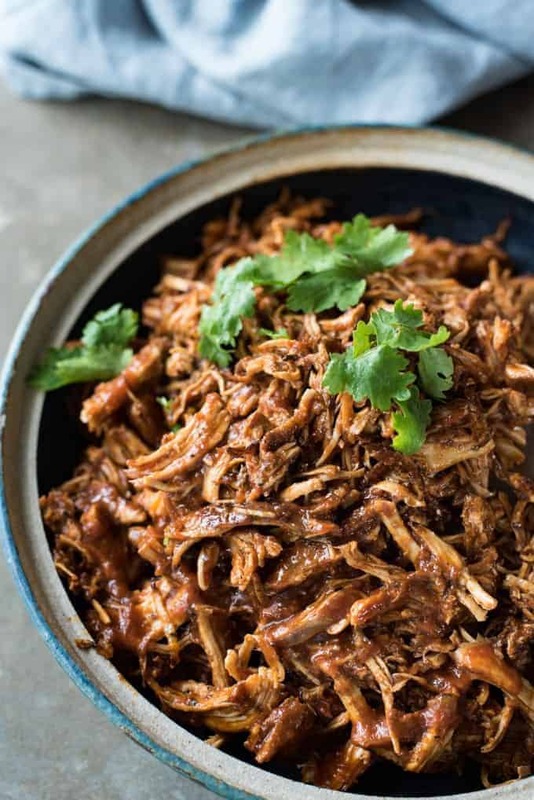 Shredded chicken breast tossed in a killer Mexican sauce, loaded with smokey chipotle flavours. It’s easy, takes 5 minutes to prepare and you can make it in the slow cooker, pressure cooker or on the stove (directions provided for all). Use it for tacos, enchiladas, burritos, soup, on rice, quesadillas, sliders – the possibilities are endless! I know there are a gazillion Mexican chicken recipes out there in this big-wide-cyber-world. I’m throwing my hat into the ring because I think this is a little different to most. Serve and look like a champ. (I like this step the best). 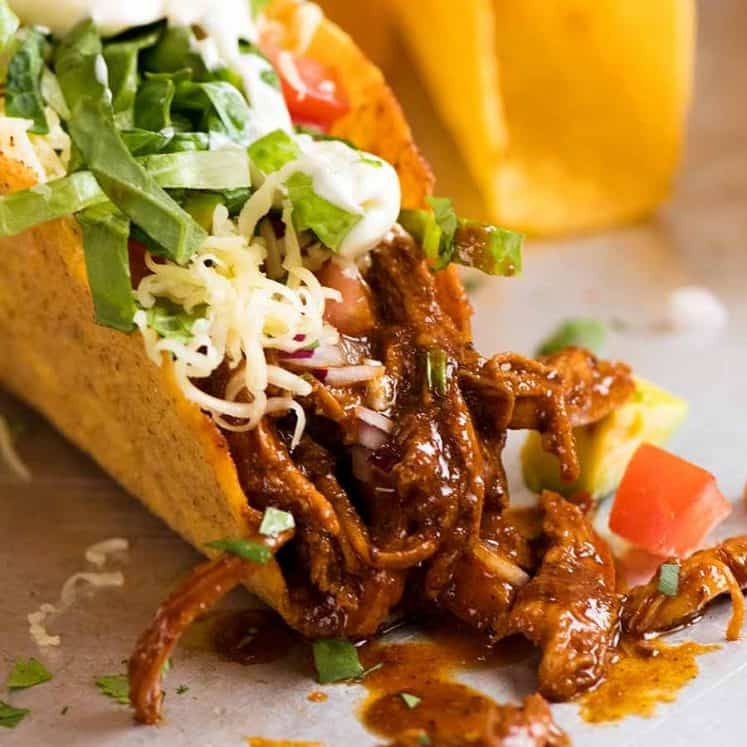 A key ingredient in this recipe is Chipotles in Adobo Sauce. To me, this is to Mexican cooking what soy sauce is to Asian cooking. Well, not soy sauce. More like oyster sauce or hoisin sauce. Because Adobo Sauce has a lot more complex flavours than soy sauce. 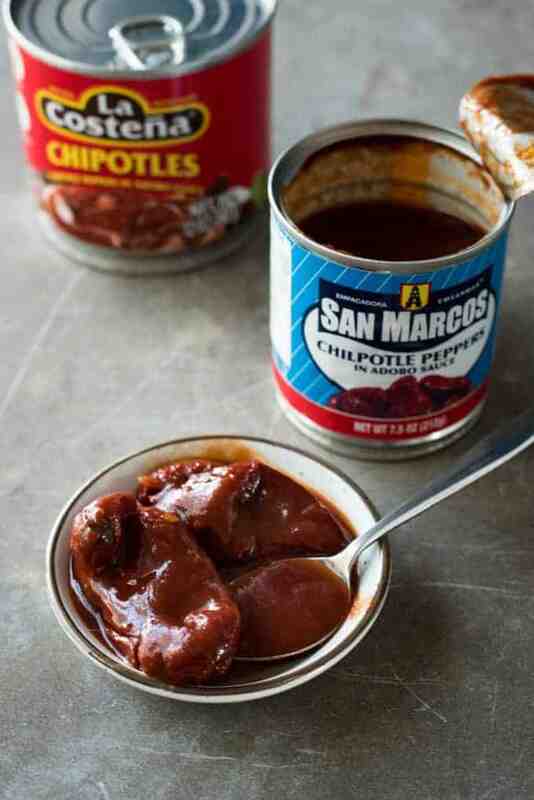 It comes in a can and is dried chipotles in a thick smokey, tangy, spicy, slightly sweet red sauce. It’s not expensive, about $3 – and freezes great! I put it in small ziplock bags and break bits off as required. 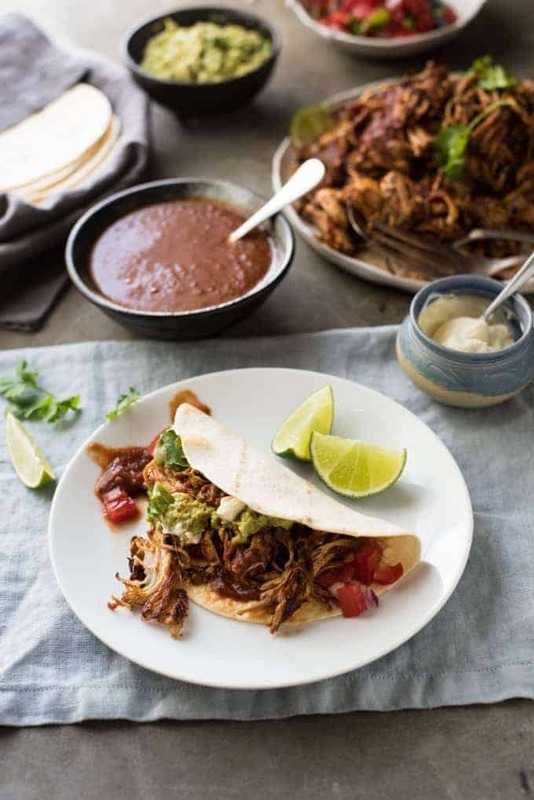 Brush onto meat and grill it, add it into sauces – it’s like a secret weapon for a quick blast of Mexican flavour. Though common throughout the US, it’s not yet mainstream in Australia (i.e. not at Coles, Woolworths), but I’m 20000% confident it will be in the near future as more and more people are discovering it’s magic power. I’ve listed places I know that sell it in the recipe (in Australia). 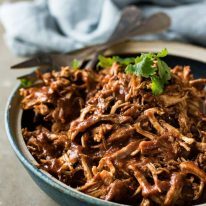 Aside from the gorgeous, rich red sauce, you may have noticed that the shredded chicken has beautiful crispy brown bits. Let me be clear – this does not and cannot happen from cooking in the sauce! I do an extra, optional step of browning the chicken. I really think this extra step is worth it because the browned parts are the best bits!! The caramelisation adds flavour and texture, plus it makes the massive pile of chicken even more enticing, don’t you think?? You have the option to serve this with the chicken tossed in the sauce, or to serve the sauce on the side, like in the photo below. I don’t have a preference for either, it really depends on the occasion, who I’m feeding (clearly not vegetarians), and how long I think the chicken will be sitting around for. If I think the chicken is going to be out for a while, I usually toss it in the sauce because it keeps the chicken nice and moist (chicken breast has a tendency to dry out quickly when it cools) without losing too much crispiness. P.S. Oh, just in case you need another eyeful of the chicken tossed in the sauce, here you go. Wipe your chin and get into your kitchen! 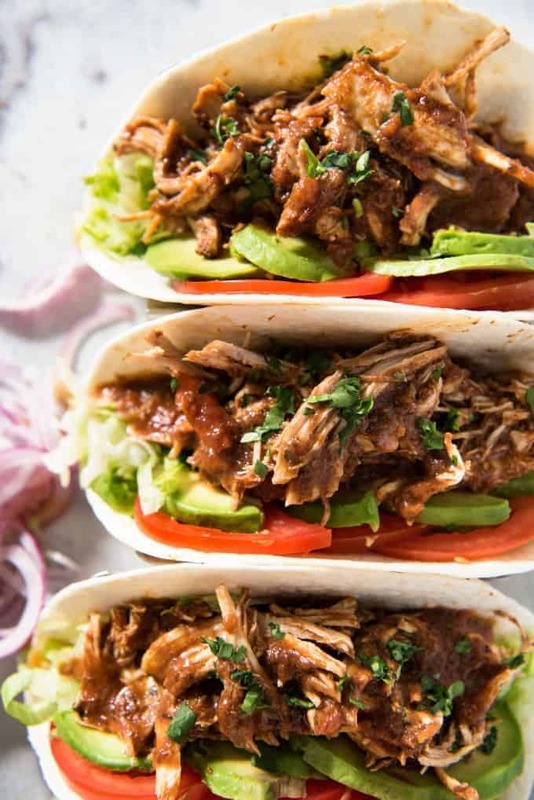 5 minutes prep is all that's required for this shredded chicken tossed in a smokey, mildly spicy red sauce that's loaded with flavour. 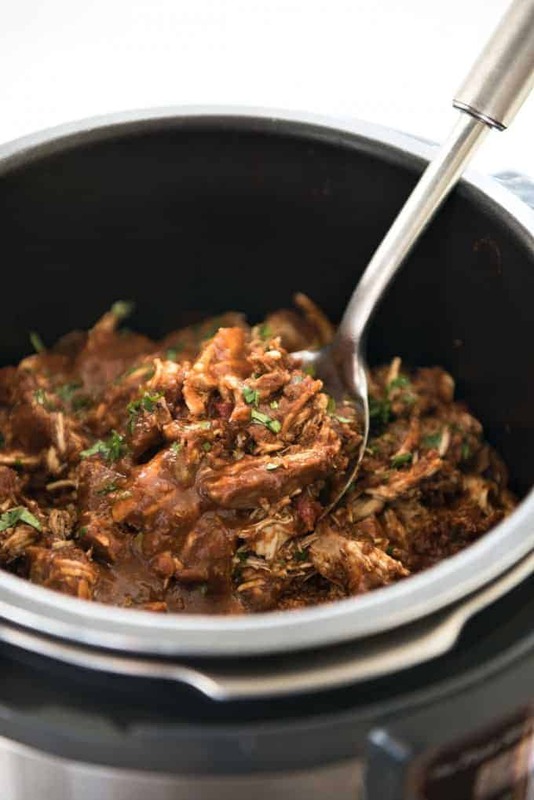 Make this in your slow cooker, pressure cooker or on the stove - directions provided for all! 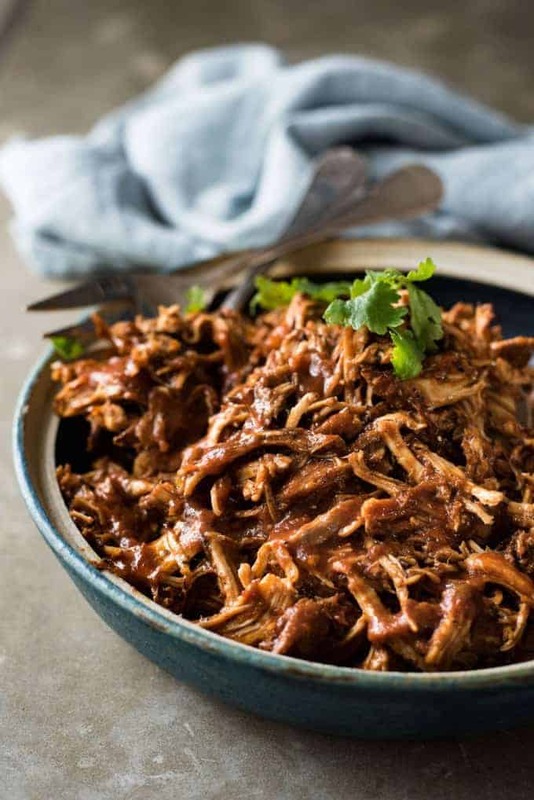 Slow Cooker: Place Chicken & Sauce ingredients in the slow cooker and cook for 4 hours on low. The chicken is ready when it can be shredded easily with 2 forks but it should NOT be mushy (i.e. overcooked). Pressure cooker: 35 minutes on high. Stove: Place Chicken & Sauce ingredients in a medium saucepan and add 1 cup water. Simmer covered on medium low for 40 - 50 minutes, turning chicken occasionally, until chicken can be shredded with 2 forks. Add lime juice (to taste) and 1 tbsp olive oil to the sauce. Use a stick blender (or transfer to blender) to puree the sauce. Adjust salt and pepper to taste. You should have about 2 cups of sauce. Heat 1 tbsp oil in a large skillet over high heat. Add 1/3 to 1/2 the chicken and fry until dark golden brown on one side, flip and cook the other side very briefly (don't brown), then remove. Use 1 tbsp oil for each batch you fry. Toss chicken in the sauce OR serve it on the side. Use for tacos (guacamole and Pico de Gallo, enchiladas, burritos, on green Mexican rice, quesadillas, sliders, on tostadas. 1. 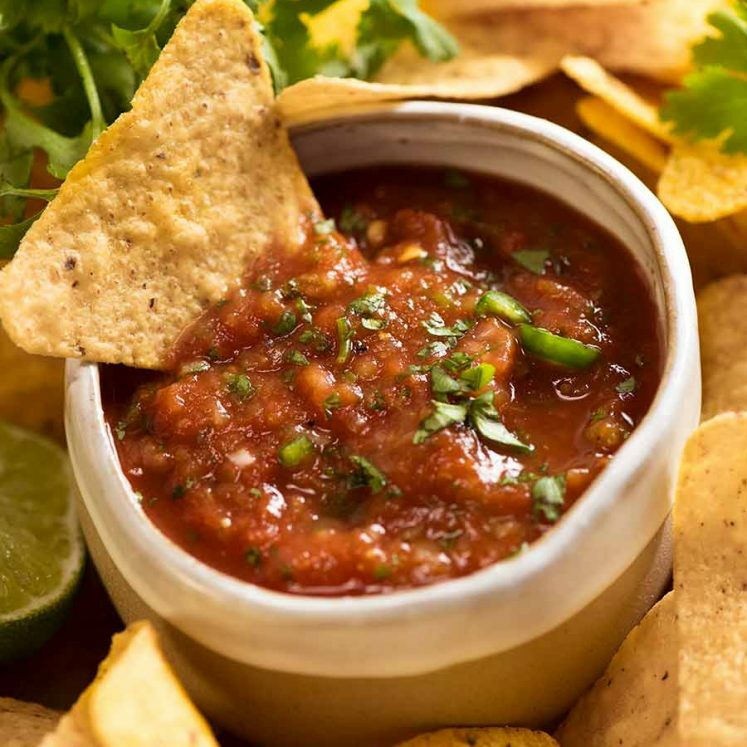 Chipotles in Adobo Sauce is to Mexican cooking what soy sauce is to Asian cooking. It is dried chipotle chillies in a flavoured red sauce that is quite spicy. You can find Chipotles in Adobo in the canned goods aisle in most supermarkets in the US (its widely available there). In Australia, it is sold at Harris Farms, Thomas Dux, The Essential Ingredient in Rozelle (Sydney), Fiji Market in Newtown (Sydney), some Asian groceries and online from Firework Foods. I'm sure it's available at other speciality stores too, they are just the ones I know. Do a taste test to check for spiciness because brands can differ, though the brands I use in Australia are fairly similar. The ones I use are spicy but not "blow your head off" spicy. If yours is "blow your head off" spicy, you may want to use less. But note that the spiciness loses it's edge overnight! Leftovers freeze perfectly - I pop it in small ziplock bags, flatten it out and it's easy to break a bit off to use as needed. If you really can't find Chipotles in Adobo Sauce but are still keen to try this dish, use 1 1/2 tbsp chipotle powder + 2 tsp SMOKED paprika powder + 1/4 cup sriracha (YES, really, it's pretty close to Adobo Sauce when combined with chipotle and paprika) in place of the Chipotles in Adobo Sauce. 2. I use table salt. If you use kosher or sea salt flakes, use an extra 1/2 tsp. 3. Use 1 tbsp for each batch of chicken pan fried. 4. The chicken drops a lot of juice while cooking so there will be plenty of liquid in the slow cooker / pressure cooker. For the stove top, extra water is added so it ends up with the same amount of sauce at the end. 5. TO STORE: This makes lots because it keeps well and it's a bit hard to make the Sauce with less chicken. It keeps for 3 days in the refrigerator. To freeze, I shred the chicken and freeze it separate from the sauce before pan frying. Defrost, then pan fry the chicken per the recipe, reheat sauce separately. 6. This makes enough for around 15 to 20 tacos, serving around 5 to 6 people (3 tacos per person). 7. 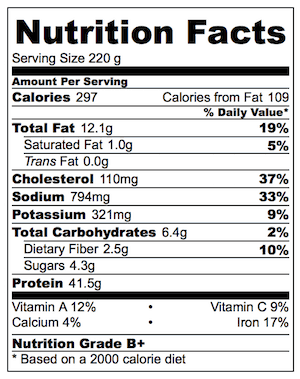 Nutrition per serving, chicken and sauce only (not tortilla wrap and toppings), assuming 6 servings. 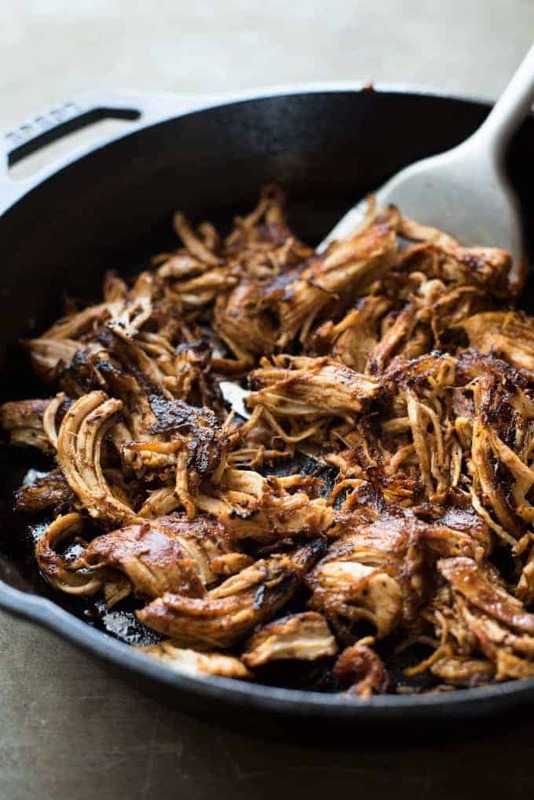 Oh – and just in case you’re after PORK rather than chicken, here is a little peek at my PORK CARNITAS. Oi. So good. Check out those crunchy brown bits sparkling with the gorgeous flavoured juices! Hi Nagi! I’m wanting to make this tonight but don’t have a blender…any recommendations to how I can purée the sauce? I was thinking possibly with a Kitchen Aid stand mixer? As a side note, you can buy chipotle in adobo from the USA Food Store – they have actual stores in Melbourne and Sydney but you can also buy online. Hi Bianca, yes it’s been a while since this post – Harris farm now stock it as well. I’m so glad you love this recipe, it’s so versatile! Can you brown the chicken before placing into the slow cooker? I cooked this tonight, and it was outstanding. Didn’t change a thing, and did it in the Instant Pot. Thank you, Nagi, for another winner, as all your recipes are. Awesome Meredith, I’m so happy it was a hit! I’m going to try this recipe but I’m not sure what temperature should I set. What do you consider ‘LOW’? I’m using Tefal Cusine Companion with slowcook programme. I was just wondering if you can use thigh fillets instead of chicken breast. I find chicken breast to be dry and not as yummy. Natural release or quick release for instant pot? And 25 minutes or 35? I had the same question – actually I started with frozen chicken so even more concerned…that said, I cooked at 35 mins, then did 10 min natural release followed by a quick release. Chicken was plenty cooked, soft, easy to shred. That makes me think maybe even the 10 min natural release is unnecessary (especially if you didn’t start with frozen chicken). All that to say, turned out perfectly for me and I finished it with the browning/crisping in the pan. Hi, I’m about to make this tomorrow and I accidentally bought boneless/skinless chicken thighs. How should I adjust the cooking time for a slow cooker? Can’t wait to try this! Thank you! I am making the shredded Mexican chicken right now. I live in Arizona so everything I need is available. I had to start before I could find the recipe again, but I did remember all the ingredients and how to start the chicken. Yay me! It smells fantastic. I am also going to make the Mexican red rice. Having company and I know they will love this, too! Thank you for the great recipes!!!! Hi Nagi, Good news woolworths now has the Chipotles in Adobo Sauce the same brand that you have in the photo. They have some of that brands products but not alot. Can’t wait to try it. Your recipes are always so good. Ah! I must update this recipe! I was so thrilled when I saw that 🙂 Now for canned green chillies, and I’m set!! Oh – and chipotle powder!! Its the La Costena Brand and its a in glass jar. They seem to be getting in some different products which is good. Especially for those like myself who live in country towns and we don’t have access to Specialty supermarkets. Ps absolutely love your recipes!! Tried this in my instant pot and it was fabulous! I cooked for 25 mins on high, more than doubled the recipe as I did 5lbs of chicken. It was a recipe I’ll make again! Did you place chicken and sauce in instant pot? The directions are unclear whether it should be done separately or not? Yep, both chicken and sauce right in there! Made this mexican shredded recipe last night. My boyfriend and I LOVED it. Will definitely make it again asap. 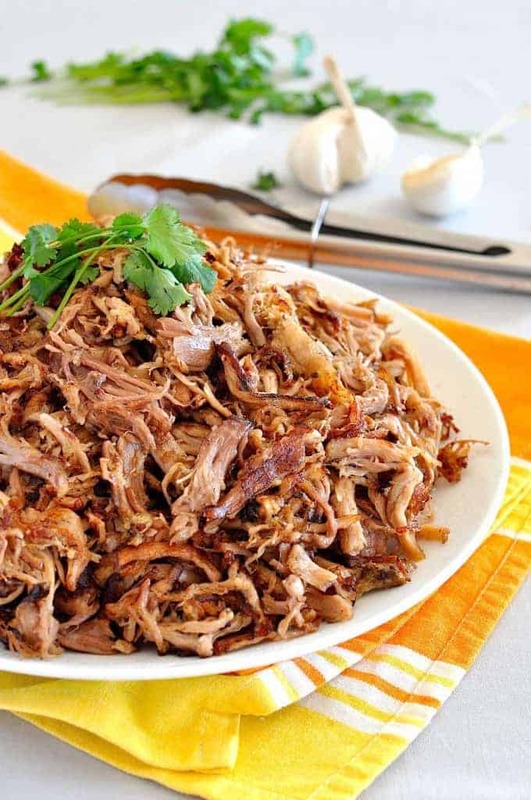 A HUGE fan of your pork carnitas recipe. Love it! Decided today to try the mexican shredded chicken. What are the “make ahead” instructions? Want to cook chicken one day and then serve the next day. Do I pour juice over chicken and fry and then put in refrigerator or wait until day of serving for this step? Thanks a million for all your fabulous recipes.